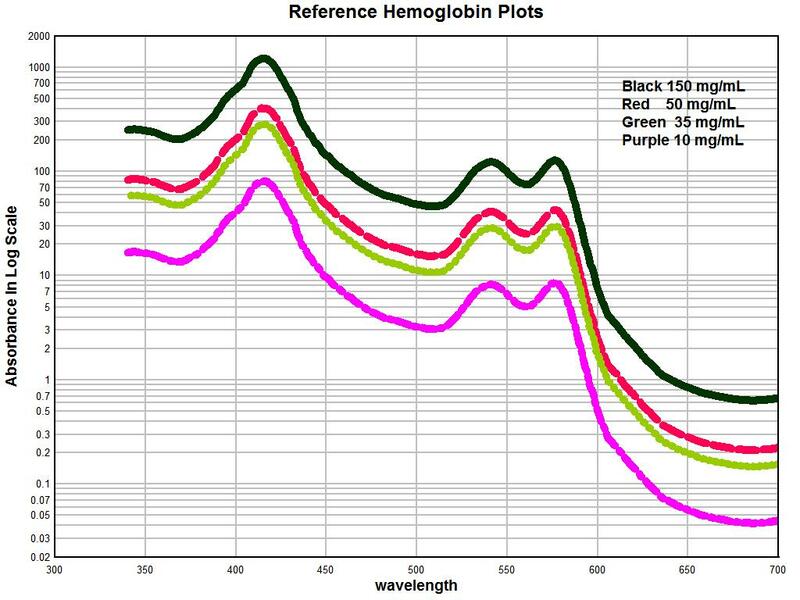 The red line in the graph shows the average hemoglobin spectrum as measured within a set of nine essentially random individuals, ranging from approximately 23 to 70 years of age. The sample size may be increased further in the future but statistical significance is nevertheless already attained. Such a monumental change in the basic nature and character of a fundamental and crucial protein within the human body is a manifestation of significant biochemical changes within that same body. By no measure of a “normal” state of health would such a change be regarded as within “acceptable” or “expected” boundaries. The fundamental nature of the protein, i.e., blood, has been changed in the case presented. This researcher continues to contend that state of the blood of an individual is one of the most reliable, if not the most reliable, indicators of the existence and severity of the so-called “Morgellons” condition. 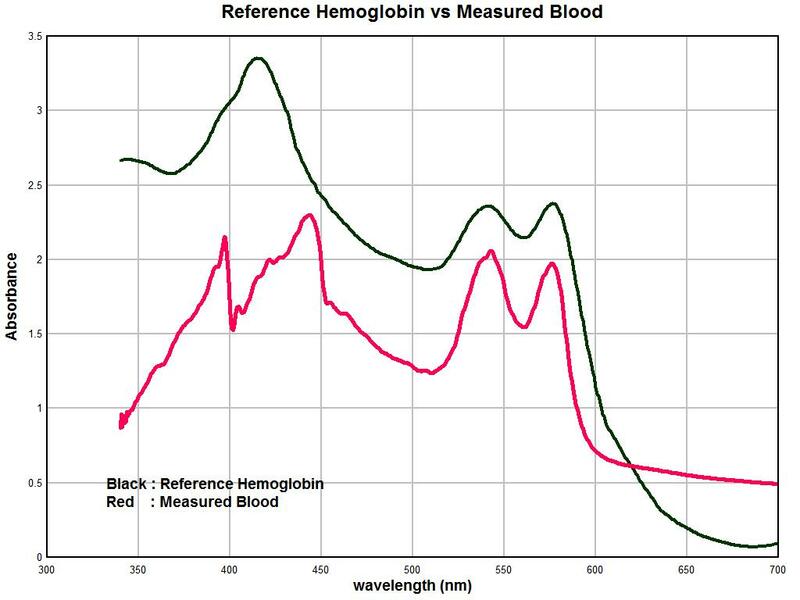 One of the ironies of the current research is that establishing a reference spectrum for hemoglobin, from current human blood samples, is problematic. At this point none of the human blood samples studied are able to reproduce the expected spectrum of hemoglobin. Each sample examined thus far demonstrates significant deviation from this expectation, as will also be described further below. This finding, now from a spectral perspective, is actually in line with the concerns expressed by this researcher some time past, and this is that the general population appears to be subject to the so-called “Morgellons” condition to varying degree. The heart of this research, then and now, is upon a particular organism repeatedly identified in the blood of all samples observed, along with oral filament samples that are also characteristic of the condition. As such, it has actually been necessary to develop the “reference” hemoglobin spectrum from the literature, as no “pure” or live case is available to me at this time. The graph above is such a set of reference spectrums that have been developed from the literature on the subject2. 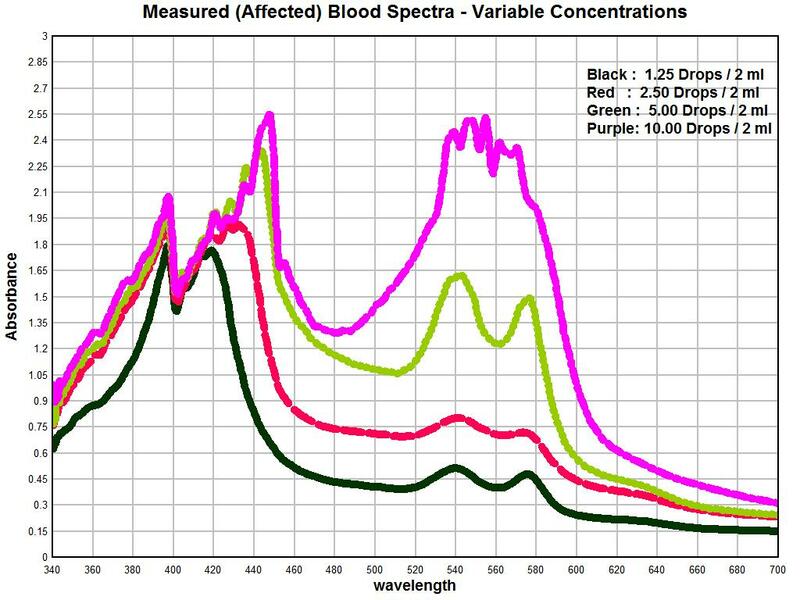 The concentration of a substance can also affects its spectrum, and thus a process has been generalized to determine an appropriate spectrum for various concentration levels. 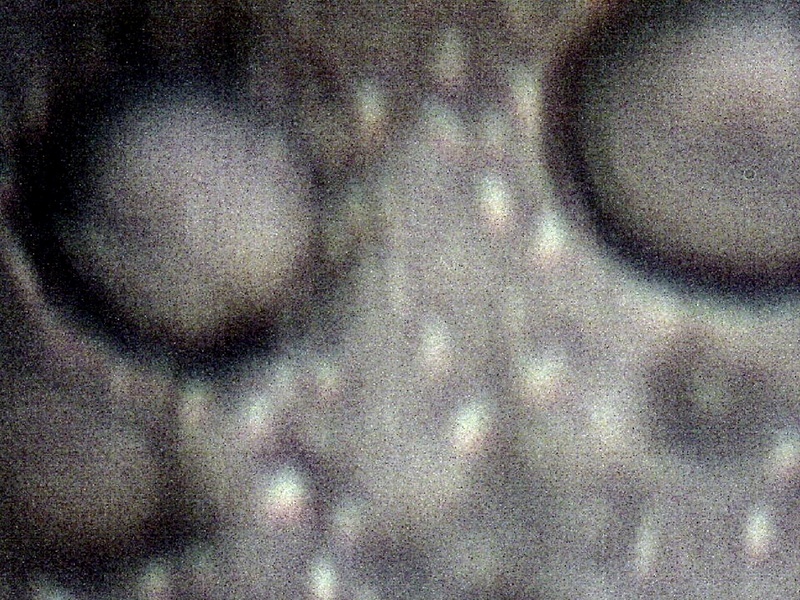 The photographs above revert to the alternative method of investigating the nature of the problem, and this is by direct observation of the blood. This has been the historical basis for most of the work on this site until recent assistance to the Carnicom Institute (much gratitude is extended) permitted the appropriation of helpful instrumentation. 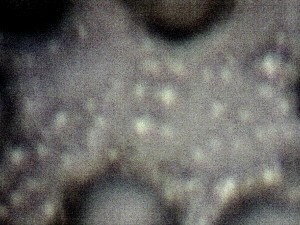 The larger structures are red blood cells, at approximately 5000x magnification. What is essentially being recorded here is the saturation of the surrounding blood plasma with the organism that is under study and as it has been repeatedly described on this site. 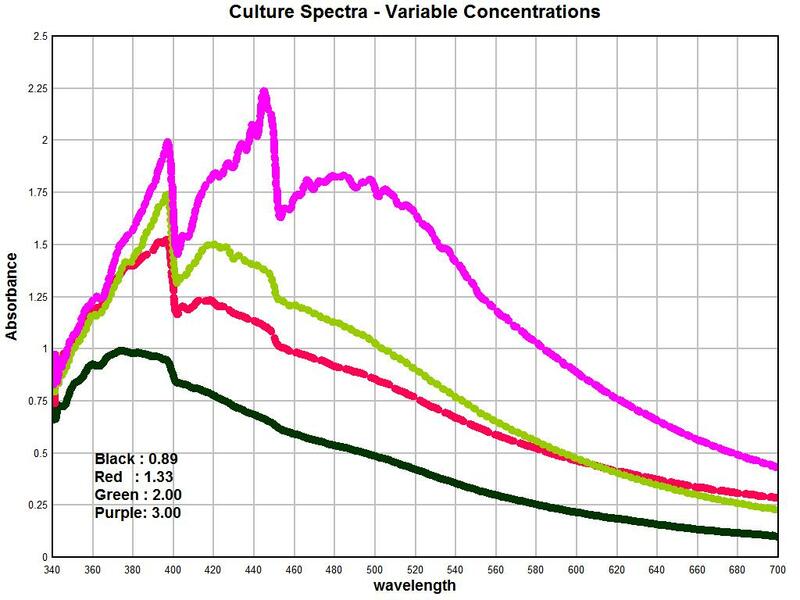 This organism is at the sub-micron level and it is responsible for the culture spectra that have been shown in this report. At this stage both observational and instrumental techniques are available to study the nature of the “Morgellons” condition, and all information indicates a consistent and significant alteration of the basic nature, biochemical properties, and physical condition of the human blood.